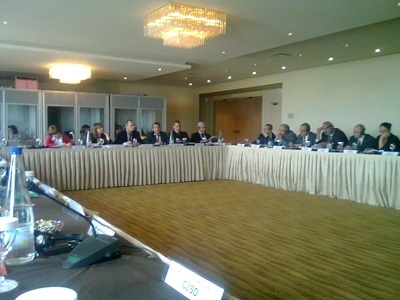 The Meeting of the Directors of the National Statistical Institutes (NSI) of the Mediterranean Europe Neighbourhood Policy (ENP) Countries was jointly organised by the Statistical Office of the European Union (EuroStat) and the Development and Cooperation Directorate General of the European Union (EuropeAid) on 29 May 2012 in Athens, Greece. The NSIs of the OIC Member Countries including Algeria, Egypt, Jordan, Lebanon, Morocco, Palestine, and Tunisia participated in the meeting. Mr. Atilla Karaman, Researcher, attended the meeting on behalf of the Centre. Co-chaired by Ms. Claudia Junker, Head of the Statistical Cooperation Unit, EuroStat, and Mr. Christoph Ingels, Head of the Neighbourhood Countries Sector, EuropeAid, the meeting had the main aim to discuss the finalisation of the post-MEDSTAT strategy. After the welcoming remarks of the co-chairs, Mr. José Luis Cervera, EuroStat Consulant, made a presentation on the revised version of the post-MEDSTAT strategy document that was discussed in Luxembourg in November 2011. Following the presentation, the representatives of the participating NSIs of the OIC Member Countries stated that the revised version reflected the discussion that took place in Luxembourg. In addition, they wanted the new program to be carried out should not only be restricted to the financial and economic fields but also should continue to support the NSIs concerning increases in their capacities and data qualities. Under the Specific Objective 1 “Improving Production” of the Strategy Document, the participating NSIs of the OIC Member Countries also backed the Transportation sector to be added as a priority topic in addition to the sectors of Employment/Unemployment, Energy, Migration, Trade, and Business Surveys/Registers previously mentioned in the document. Metadata of PCBS is in line with the Accelerated Data Program. The first day of the meeting was finalised after two sessions on the terms of reference of the Forum, and Working Groups. The meeting ended on 1 June 2012 with the session on useful lessons learnt from the European Conference on Quality in Official Statistics (Q2012) that was held on 30 May-1 June 2012 in Athens, Greece.